When I was a teenager I used to sit on an empty field listening for hours to the sounds of distant cars, railroads, helicopters, and other motorized objects. These sounds, which are very rough and noisy when they are near, attracted me from the distance because they had merged and diffused into a continuum when they reached my ears. By this experience it came to my mind that it is more satisfying for me to listen to continuous changes within one sound than to the combinations of discreet sonic events usually found in music. Remembering that a few years ago I began to search for possibilites to create continuous sonic situations with controlled dramatic development that cannot be expressed in traditional terms of melody, harmony, and sound color. The five pieces collected on this compact disc are my first results. licence terms are same as for the free track of the month series. 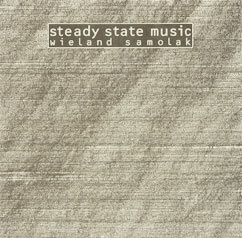 In 1993 a new label, imbalance recordings, released a radical and beautiful ambient / drone CD, Steady State Music, created by Wieland Samolak. Wieland Samolak used to work for the Munich branch of the legendary Synthesizer Studio Bonn. He was also the creative mind behind the even more legendary advertisements of the shop and wrote user manuals and translations for Emu Systems and Sequential Circuits. 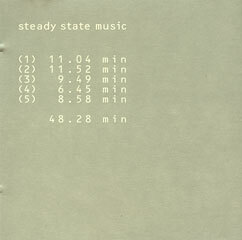 Robert Henke and Gerhard Behles first met at Wielands studio/appartment above the shop in 1988. 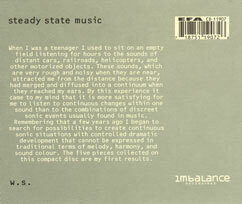 Imbalance recordings was a small label, it was the first release, and Wieland Samolak was not a known artist. The CD only sold a few hundred times. However, more than ten years later this release is still worth listening to and we are very happy that due to Wielands generousity it is now available as a free download from this website.